As it turns out, wave 5 did extend lower and hit the wave 5 target projected on the chart the next day. As mentioned in the February 8 commentary, a 5-wave decline is generally followed by another leg lower. However, the rally from the February 9 low at 2,532.69 is not clearly corrective. The chart below identifies the next key levels to watch. Corrective rallies tend to retrace no more than 61.8% of the prior decline. The 61.8% resistance level for the S&P 500 is at 2,743. Red trend line resistance (going back to April 2016) is at 2,723. 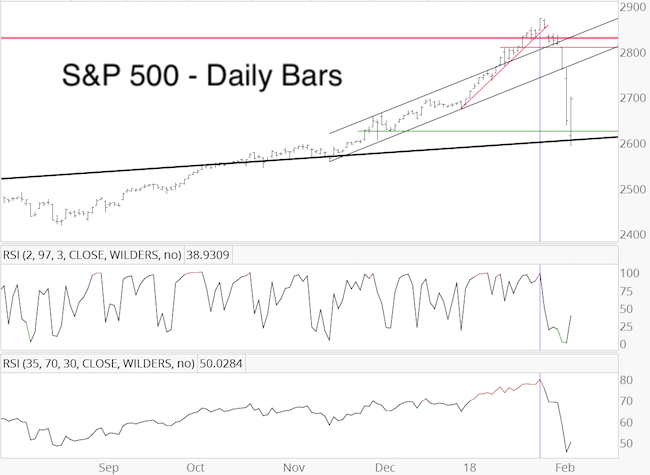 Thus far, the rally from the February 9 low has been strong in terms of price (170+ points in 4 days), but not necessarily breadth. 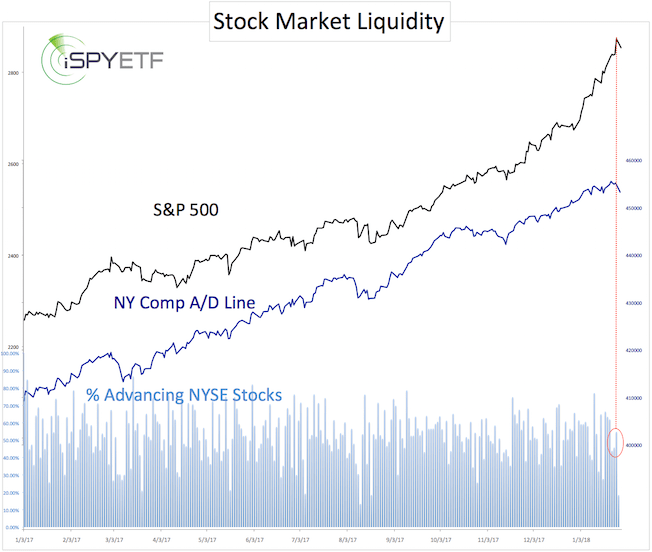 As the lower graph shows, the percentage of advancing NYSE stocks barely exceeded 70 the last week. That’s not weak per say, but also not unequivocally strong. A day or two of 80%+ readings would have been more indicative of a sustainable rally. 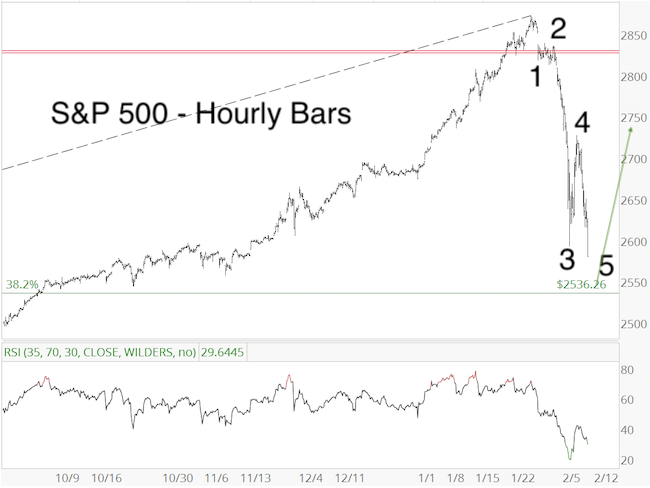 In short, how the S&P reacts to the 2,723 – 2,743 resistance cluster should provided clues about whether stocks will relapse to test their panic lows or move toward new all-time highs. What caused the February meltdown? If you are looking for another strong opinion, sorry, you won’t find it here. 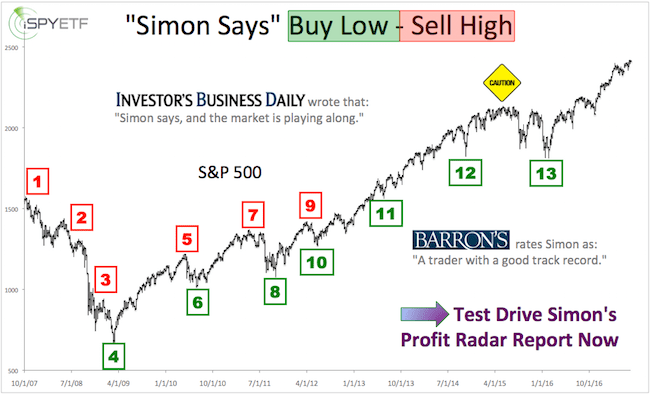 Before we address the more important issue – whether now is the time to buy or sell – here is one tell-tale sign (of what contributed to the ‘meltdown’) brought out by the January 29 Profit Radar Report. The correction sure was immediate, and it didn’t stop at 2-8%. 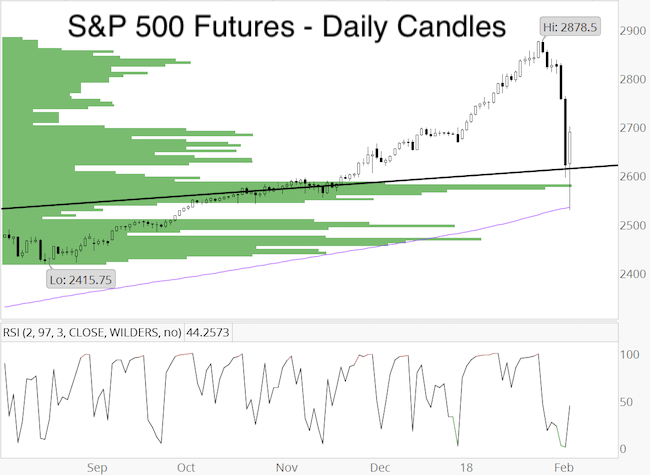 Since much of the recent market action happened overnight, we’ll first be looking at the S&P 500 futures chart, which includes overnight trading activity. The S&P 500 cash index looks a little different, as the pullback was ‘only’ 9.74%. Here is one reason why we expect eventual all-time highs: RSI-2 was overbought, which suggested risk, but RSI-35 confirmed the January 26 all-time high. RSI-35 also confirmed the December 2016 and March 2017 highs. As we mentioned many times in recent years, stocks rarely ever carve out a major top at peek momentum. This clearly is a market that plays by its own rules (the rules are: there are no rules). Nevertheless, nearly all our studies and indicators suggest a resumption of the bull market once this correction is over. 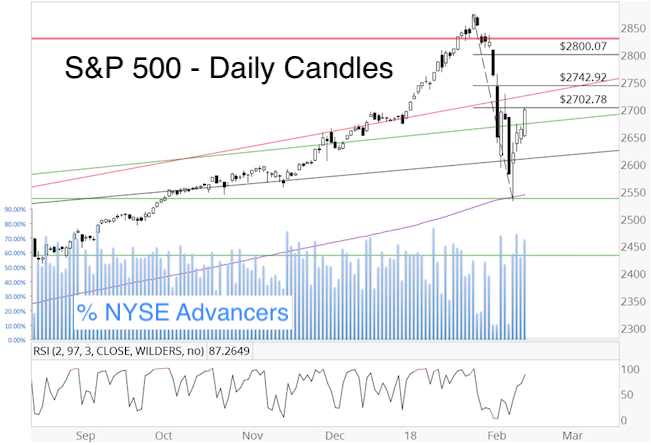 S&P 500 futures already met our down side target, the S&P 500 cash index not yet. Ideally we’ll see a test of the panic low with a bullish divergence for a higher probability buy signal. Either way, we consider this a buy the dip market. Continued updates and trade recommendation are available via the Profit Radar Report.